Spring is just around the corner! Next to fall, spring is my favorite season. I love watching flowers and trees bloom and the return of all the little creatures. So, this week, I thought we would look at one of those creatures that appears in the spring- FROGS! Here are my top 10 picks for books about frogs. 1. 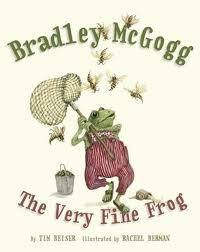 Bradley McGogg, The Very Fine Frog by Tim Beiser came out in 2011. Bradley learns that not everyone eats the same things as he does, and that is ok. It really has a great message about respecting customs and preferences of others. 2. 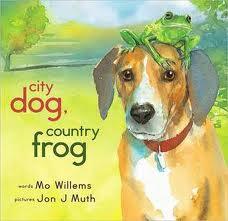 City Dog, Country Frog by Jon Muth is a story with a deep message. The tale of finding a friend and then losing him gently teaches that all living things have a beginning and an ending. 3. 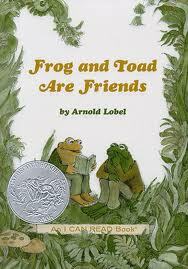 Frog and Toad are Friends by Arnold Lobel is a classic in a series of books by Lobel. 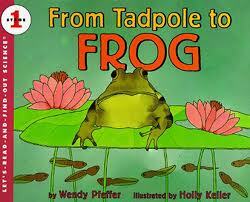 There are five silly adventures in this book highlighting the everlasting friendship of a frog and a toad. 4. Jump Frog, Jump! 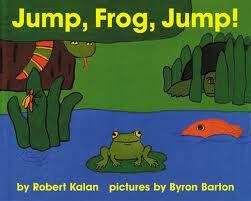 by Robert Kalan is a fun cumulative tale that will get the kids up and jumping. 5. Tuesday by David Wiesner is an almost wordless book about frogs who take flight on their lily pads. The illustrations won Wiesner a Caldecott award in 1992. 6. 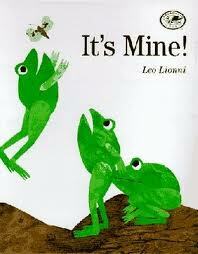 It’s Mine by Leo Lionni is a tale of three frogs who argue all day about things that they find and want to claim as their own until they learn from a toad that sharing is much more rewarding. 7. Bentley & Egg by William Joyce follows a frog who is in charge of watching a duck egg. He decides that the white egg is boring and colorfully decorates it. Well, it is mistaken for an Easter egg and the adventure begins. 8. From Tadpole to Frog (Let’s Read and Find Out Science) by Wendy Pfeffer is a good basic introduction to the life-cycle of a frog for early readers. 9. What is the difference between a frog and a toad? 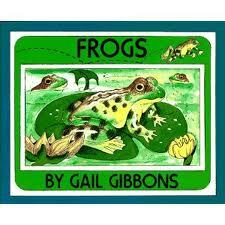 Check out Frogs by Gail Gibbons to find out. Plus, you will learn oodles more in this great read. 10. Red-Eyed Tree Frog by Joy Cowley showcases photographs from the Central American rainforest of a red-eyed tree frog searching for food and dodging predators. Nothing beats Frog and Toad! Great line up, thanks for sharing.